An experienced sea kayaker may be chatting, watching wildlife or checking the chart but is always aware of powerboats, sailing yachts or ferry services that may run somebody down; the sea for a mile ahead in case of boomers or surf; the sky for five miles to windward for dark cloud indicating the approach of strong winds or line squalls; the group's position and its distance from the start point, destination and nearest safe landing place; the likely effect of any local currents; the group's actual present rate of progress over the ground; and how the time is going. 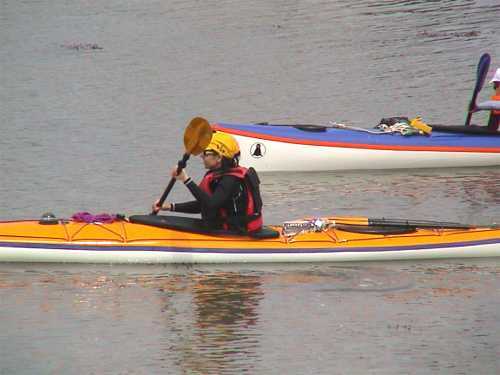 There are half a dozen ways in which a kayaker can check his or her progress while going along. 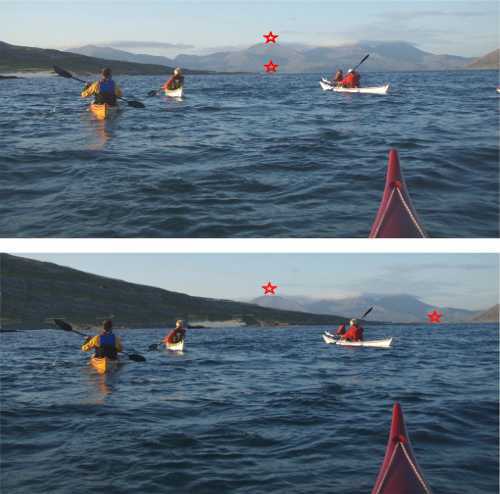 Visual checks and timing with a wristwatch are useful on most sea kayak trips. An experienced kayaker uses them constantly, often without being aware of it. Checks requiring chart and compass are useful for advanced trips, in particular for long open-water crossings. On a voyage, a sailor will record a yacht's speed and direction through the water and use it to calculate the yacht's approximate position. This is dead reckoning or DR. By adjusting the DR position to take account of winds encountered during the day and tidal stream data (s)he can calculate the yacht's estimated position or EP by drawing a series of triangles as previously discussed. Because kayakers afloat have no speed log or anemometer and can seldom spare both hands to draw lines on a chart, we seldom plot a DR or EP. But we can keep an eye on our position relative to nearby landmarks so we know where we are at all times. Close study of a 1:50,000 map reveals an enormous amount of information about relief (the shape of hills, valleys and the coast), vegetation, and human features such as power lines, roads and buildings. A chart also has much detail which enables you to keep track of your location (buoys with their color, number and name if any; coastal features such as harbor walls and oyster fisheries, conspicuous buildings, daymarks, headlands, rivers, the direction of the coast). If you get into the habit of comparing the coast with a chart extract every few minutes you will rapidly become an ace map-reader, able to relax in the certainty that you always know where you are. And not make the mistake of two kayakers who entered an east-west channel between Scottish islands and had to be rescued after meeting the Corryvreckan whirlpool. They thought they were in a similar channel 3 miles further north, with the island of Lunga on their left and Scarba on their right. Lunga is less than 2 miles across, only 323 feet high and quite low-lying on that side. Scarba is 3 miles across, has cliffs round most of its circumference, and rises steeply everywhere to a 1500 foot peak. In fact the island on their left was Scarba and the one on the right was Jura, 25 miles long and ringed with high cliffs at that end. Most currents are created by the rise and fall of the tides, so you need to know what the tide is doing. Certainly you have your tide tables but you would not be the first to use last year's tide tables by mistake, or deduct an hour instead of adding it when converting to local summer time. Before you launch, it's worth looking to see what is really happening. In an estuary the main tidal streams usually (but not always) flow one way until the time of local high water, stop for a few minutes of "slack water", then change direction and flow the other way until local low water. In any case you have your chart or current atlas to tell you what should be happening now. So is the tide is at the level you were expecting? Is it rising / falling as you predicted? And is the tidal stream flowing in the direction you predicted? Stationary objects in the water will leave a wake like a boat, indicating the direction in which the tidal stream is flowing. Alternatively, look for a boat which is moored or anchored. If it is attached by the bow only, it will turn and point upstream. All sailboats and powerboats, except very light ones, turn to face the tide. The direction in which they point is not greatly affected by normal winds. Technically they are tide-rode, not wind-rode. So if the front of a moored boat is pointing to the right, the current is flowing right to left. Unless the boat is attached by both bow and stern, of course. This is in the Gulf of Morbihan, Brittany. Most of the water in the Gulf drains out into the Atlantic every low tide, through a small gap in which the outgoing current often reaches 9 knots. Then it screeches to a halt and comes back in again equally fast. Slack water lasts only a few minutes. Even within the Gulf, tidal streams are quite fast and a kayak can't fight them for long. Although you can certainly do a ferry glide to cross the current or work your way against it by using eddy currents. See Going Against The Current. You will note in the picture that the boats are moored only at the bow, but they are all pointing in different directions. That means it's slack water. It is in fact dead high water. If you are on the water and there is no stationary object nearby against which you can judge your speed and direction, look for some stationary seamarks / landmarks and take one or two ranges. They are sometimes called transits. If you can see two objects which are approximately in line, one behind the other, you can easily check whether you are moving right or left. Your foreground object might be a navigation buoy, a conspicuous building or a notch in a cliff. It need not be close to you. Your background object might be a distant clump of trees or a hill on the horizon. Look at them carefully for 10 seconds. Do they remain the same distance apart? If not, you are moving sideways. Probably you are being carried sideways by the current. If you want to stay on course, do a ferry glide. Usually you have to peer at the two objects for at least 5 seconds to see if they are moving relative to each other. If both the objects are distant and it takes you 1 second or less to see movement, you must be in a very fast sideways current. A ferry glide would be like trying to kayak straight up a fast river. Work out where the strong current is and go across it at 90 degrees until you get to the edge. If you are crossing open water and you can see your destination and something in the distance behind it, that is the ideal range. You can immediately see whether you are going straight. If these kayakers are expecting to go through the channel to the right of the bottom star, they're in for a lot of hard work because they're being carried right-to-left, fast. If you want to take a range but you can see only one landmark (such as a lonely buoy or island), you can achieve the same result with your compass. Find the bearing of the landmark, do the same again a few minutes later and compare the two. Timing each part of your trip is often the best way of knowing where you are and how much more you have to do. 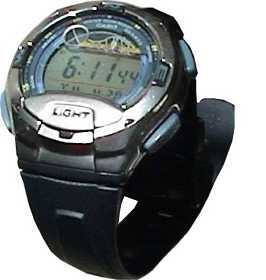 On an unfamiliar or difficult trip, wear a watch and calculate how long it ought to take to reach various points along your route. • Whether your predicted journey time will be greatly altered by wind or current. If it looks as if you may be late for a rendezvous, you can cut short your lunchbreak or call your friends before they call the Coast Guard. • When the tidal streams in the area will change direction. • The level of the tide at any beach you may want to land on. • How long it is until the local store shuts or the bar opens. • If things are going wrong, how long it will be until you reach help. • How much daylight you have left. • Whether you are near your destination. This can be useful information if you can't see any distinctive landmarks, for example because of fog or darkness. 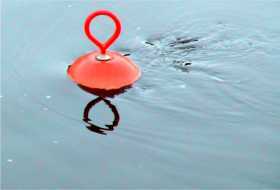 See Using A Compass Afloat. If you are making an open-water crossing you will know the bearing to your destination. You should be able to see your destination, so you can use your compass to check the actual bearing to it from your current position. If the actual bearing is different from the one you plotted on the chart, something is carrying you right or left of your intended course. If visibility deteriorates so that you can't see your destination, you can stop and find the bearing of your departure point. This is taking a back-bearing, and it will tell you if you are on the correct line but not where you are on that line. See also Plotting Your Position.